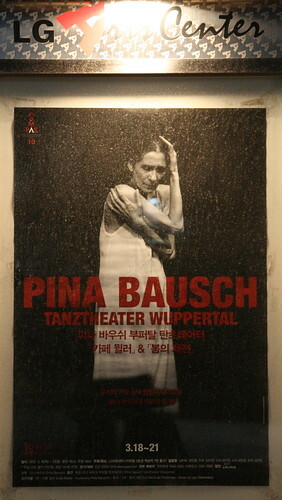 Tonight I used my hard earned won to wrangle myself the cheapest of seats at the LG Arts Center for a performance of two of Pina Bausch's masterpieces. 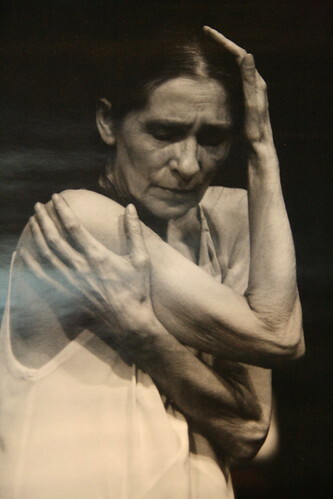 The first, Café Müller, was first performed in 1978 and is based on Bausch's "childhood memories of watching mysterious adult relationships in her father's cafe." The second was Le Sacre du Printemps (The Rite of Spring), a dark and dirty ensemble piece that was first performed in 1975. Café Müller felt like ghosts passing in the night as the tables and chairs of the café clattered to the floor and separated lovers lost and found each other. The haunting image of a woman silently treading over her lover's face after the two of them had repeatedly thrown each other against the wall in an almost orgasmic act of violence is still strong in my mind. Fifty minutes long, this piece is melancholic and mysterious as they patrons of the café mix and mingle, interchanging relationships. Le Sacre du Printemps, only thirty five minutes in length, was utterly mesmerizing and very disturbing. Over thirty dancers on a peat covered stage; dirty, sweating and ready for something to happen. Men and women flirting and fighting together in an animalistic ritualized dance. As Stravinsky's music rose and fell, the feeling of menace on stage became stronger and as it moved closer to it's climax the sense of dread and unease built into something almost unbearable. I don't go out of my way to watch contemporary dance, but this was well worth the ticket price and is a must for any fan of physical theatre. If you have enough cash then snap up one of the last remaining tickets and treat yourself to an evening of violent ecstasies. It's on until Sunday 21st March and tickets range from 40,000 won to 120,000 won.